The Perfect Trifecta: mirapoix, roux, and andouille. Ok see, it’s gotten cold here. Coldish, anyway. Enough so that we had to put a quilt (as opposed to a thin cotton blanket) on the bed, and I actually closed the windows a little because wide open was TOO cold. Anyway, I love Creole and Cajun food. They are similar but not exactly the same. Also, this post is about how I am feeling, due to situations with work stuff, not about a fancy pants recipe that you need to be impressed with…I mean (in order to refrain from offending my English Teacher Friend)…not about a fancy pants recipe for which you should be impressed. Did I mention that I am on my second pear vodka with mango juice and Pellegrino water? No? It’s good. Equal parts each. You’re welcome. So I fixed it today. It’s cool. The weather is approaching the semblance of cool fall weather that asks one to give up the salads and embrace the stew. Also? It has beans. Lots and lots of many different kinds. I love beans. They’re cheap and high in protein and wonderful. Do I have clever pictures, artistically photographed with stylish bowls and comfortable spoons? No. Of course not. However the roux with the mirepoix…oh my heavenly saints and angels that smells good. Then, after the whole mess is dumped in the stewed beans and sausage, scraping the pan of the last little tidbits of butter and toasted flour flavored with the onion….happy sigh. So flamin’ good. I am waiting for the family to all go to bed so I can shamelessly lick the pan. It’s the kind of thing you want to keep eating even though you’re full. You want to eat it until you throw up so you can eat some more. Gross? TMI? maybe…but the Roman would do it and I used to think that was weird but now I totally understand why. The weekly visit to L&D Market happened today. That’s the local place that sells locally grown produce, with a friendly 12 year old stocking tomatoes and corn, industrial fans blowing and the aroma of ripe cantaloupes wafting over you. Today was Grocery Day, the biweekly trip to restock the pantry an reassure myself that, come what may, we WILL eat well for 2 weeks. 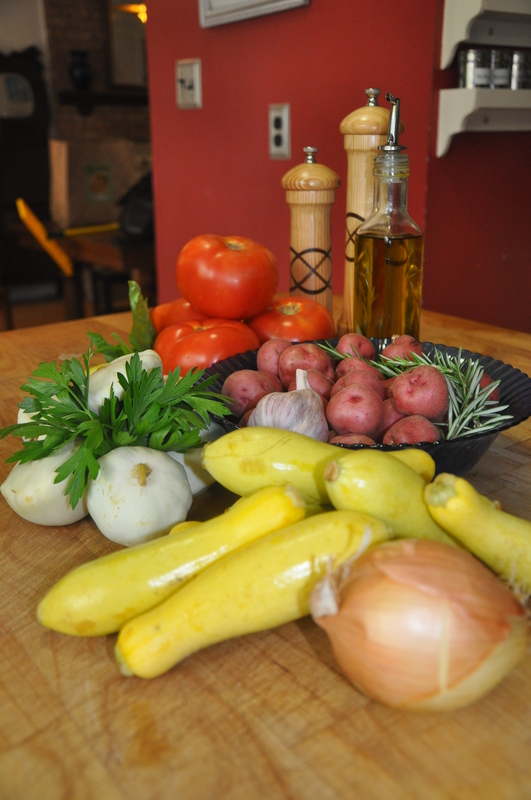 L&D did not disappoint, with tiny new potatoes, baby squash, PATTYPAN SQUASH! I LOVE PATTYPAN SQUASH! 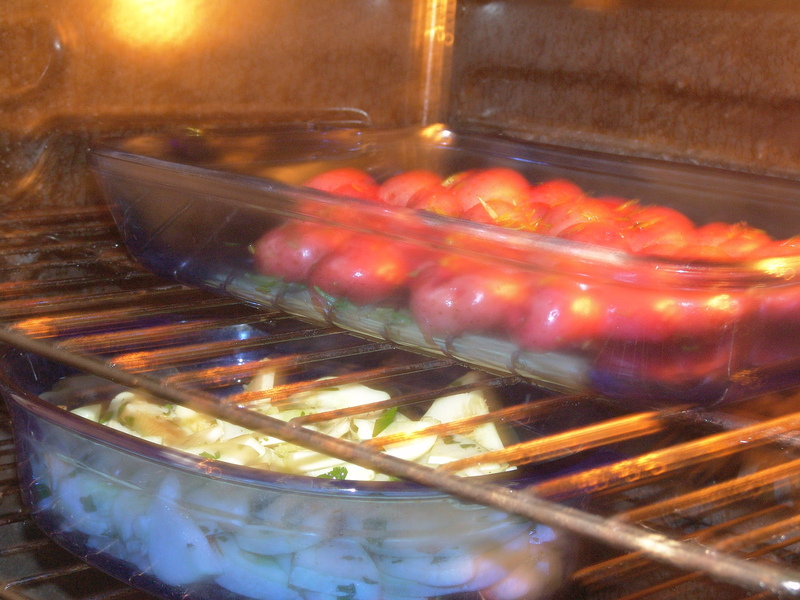 and big fat tomatoes, begging to be slices and decorated with basil from the garden. My garden…is there anyone more optimistic than a gardener in February? No, there is not. I bought seeds, and was certain by this time we’d be eating delicious things every night. We had a good bit of snow peas, that was nice,but by April they were done with. I got exactly 7 pods of English peas…how disappointing, but I tried to make the best of them by adding them to a risotto. Some lettuce, nothing to get excited about, a few tiny arugulas, but the basil looks good and the tomatoes are trying, I hope it doesn’t get too hot for them before I get a few, but down here, that is not a given. So,I rely on L&D and the gardeners who are better at it than I.
Oh the potatoes! Tiny tiny red new potatoes, just a bite or two, such a creamy texture, pure perfection. Oh the squash! I pick the smallest of the yellow squash, and treat them gently and simply. PATTYPAN SQUASH! It makes me happy with it’s silly shape and mild flavor. and on…I am waxing rhapsodic because that’s the only way to respond to bags full of just picked vegetables in the middle of June. and…pictures. I enlisted my eldest son, gave him permission to use my camera in exchange for acting as photographer. 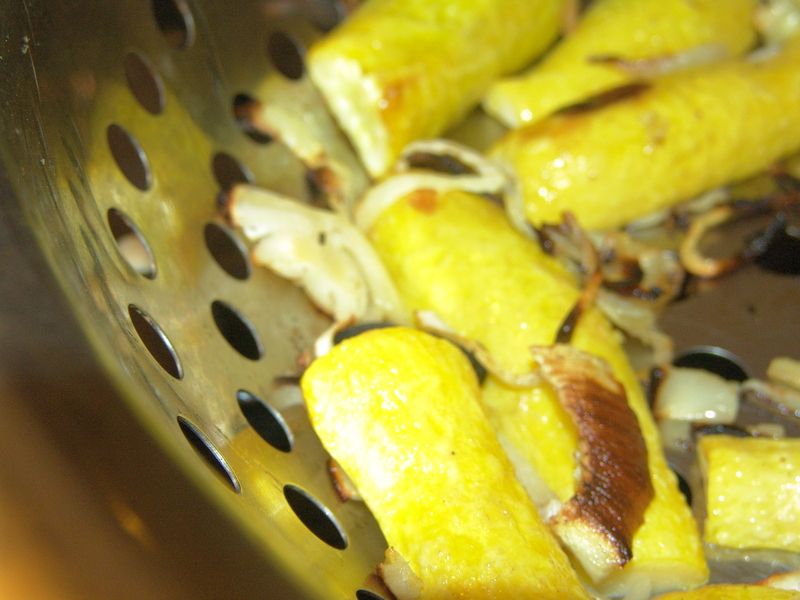 Grilled squash and onions, tossed in olive oil with cracked pepper and kosher salt. Grill on medium for 30 minutes, turn halfway through cooking. 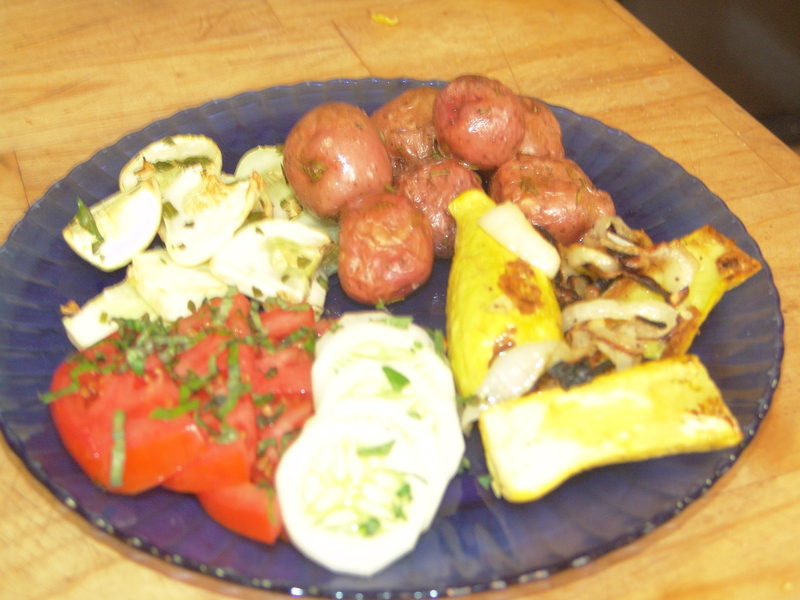 Potatoes above, PATTYPAN SQUASH!! below- toss the squash with minced garlic and chopped fresh parsley and a bit of olive oil. Roast with the potatoes- 375F for 45 minutes. The tomatoes were just sliced and sprinkled with fresh basil. The cucumbers are poona kheera cukes, an experiment in my garden, and are simply sliced and sprinkled with fresh chopped oregano. I’ve never grown poona kheera cucumbers before, and they are delicious! The skin it a bit tough so they should be peeled, and the flavor is milder and a bit sweeter than the normal grocery store type. The texture is a lot like a small pickling cucumber. When my 13 year old asked what was for supper, I told him and he said “what? no meat?” and I replied “no meat.” and he said “Ok, I’ll eat some leftover chicken from last night” and I said that was fine, if he was still hungry. Which he wasn’t…and that is a bloomin’ miracle because 13 year old boys are ALWAYS hungry. As we were eating I thought “I shoulda got some fresh mozzerella to make a caprese salad…” then I thought “I shoulda got more potatoes.” Then Terry said it wouldn’t hurt his feelings one bit if I fixed those potatoes more often. Weekly even. 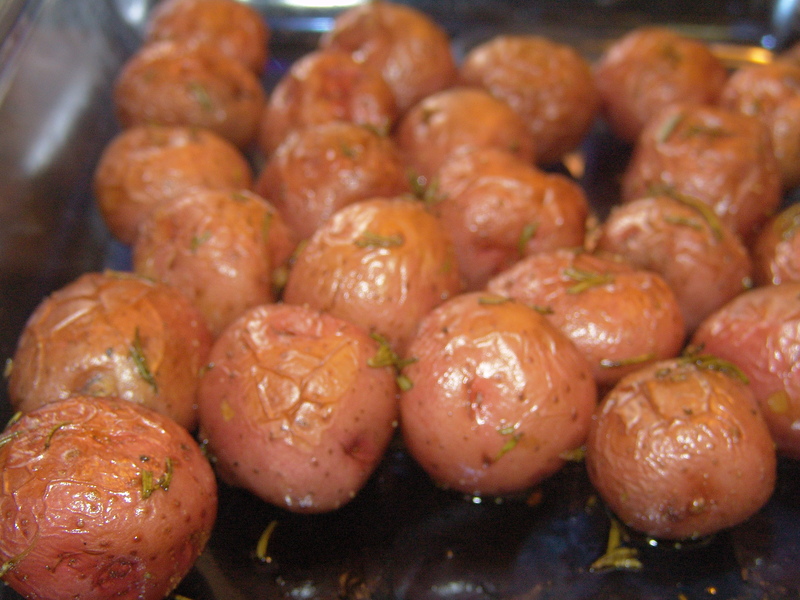 I am wondering how it would be to roast the potatoes then make a potato salad from them.